Typically my references to “boxes” and “booze” relate to a secret opening box which is paired with a cocktail. But some bottles of fine spirit come inside a wooden box, making them a “box of booze”. If we scale that idea up exponentially, we might consider the entire liquor cabinet to be a giant box of booze. I recently replaced my liquor cabinet, and installed a very special lock. 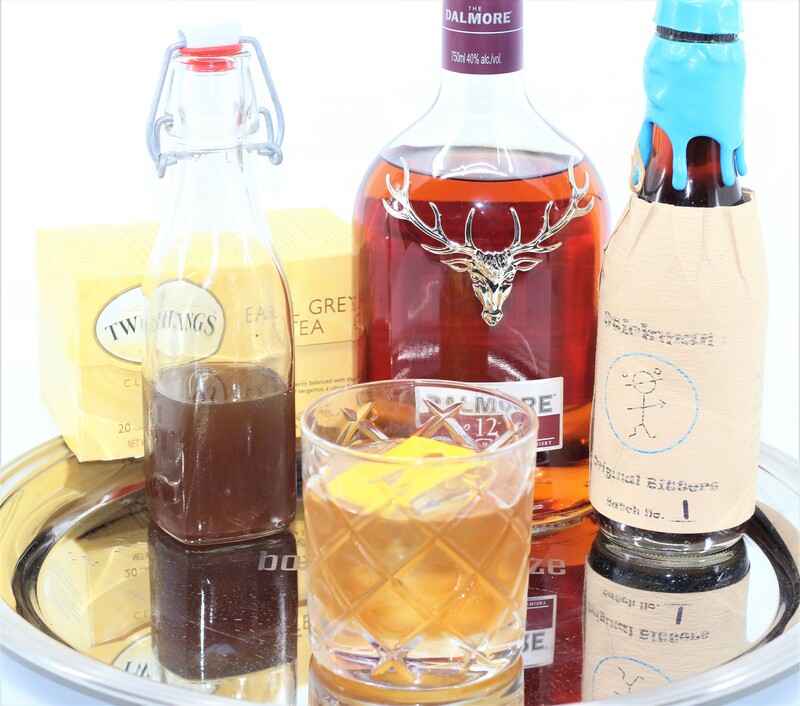 I’ve created a very special Old Fashioned to toast the designer, Shane Hales from England. Shane admits that he will drink most anything, but given a choice it might steer toward a nice whiskey. I’ve made him a truly special drink for the occasion, which features another surprising and unique element worthy of his one of a kind cabinet lock. 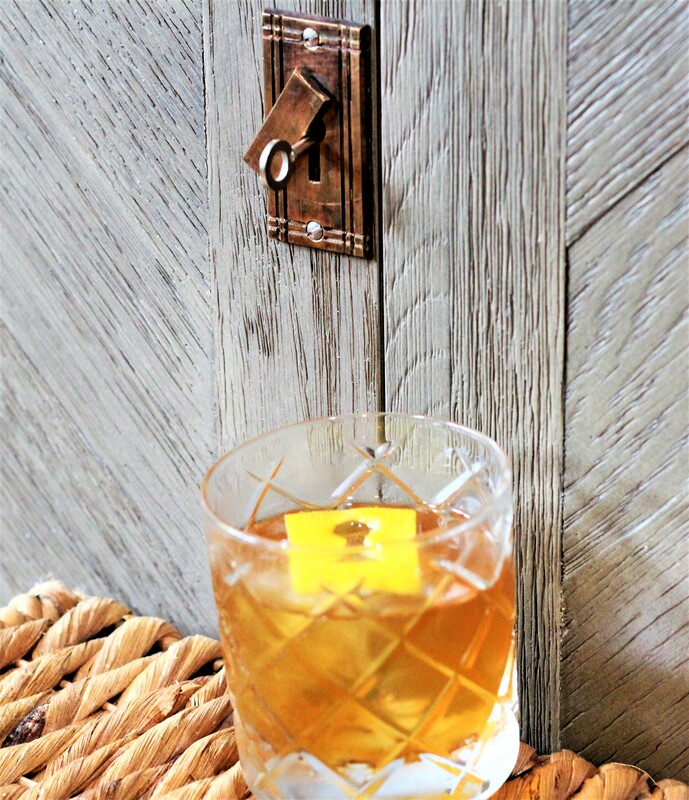 The drink is a variation of the Old Fashioned, in homage to the vintage lock. This one uses a fine single malt Scotch, although a nice bourbon will work just as well, and an Earl Grey tea syrup for a little sweetness. Shane is an Englishman, after all. And the bitters used here, an essential component of any great Old fashioned, are what really make this particular drink special. 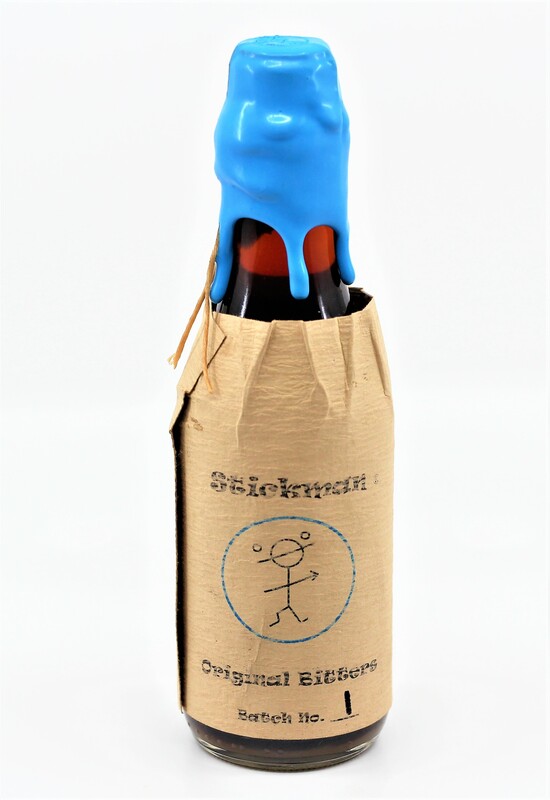 Stickman Bitters, No.1, the real star of this drink, were created by Robert Yarger, a woodworker with serious creativity beyond the box. He has an extensive garden full of aromatics, botanicals and herbs, a workshop full of wood, a rudimentary chemistry set up and he’s a bit of a mad scientist. It’s the perfect combination for making bitters. Bitters have been a staple in cocktails since the cocktail was invented, and in fact likely led to the invention of cocktails. They were originally developed by pharmacists in the 1800’s as cure-alls and elixirs to calm a queasy belly, made with proprietary formulas of herbs, flowers, fruit peels, roots and plant bark infused in alcohol and usually including a bitter flavoring agent. Patrons would have a dose as is, or more likely mixed with water. Perhaps they were so bitter that some sugar would be added, and what the heck, a dram of proper booze as well for good measure. Viola, a cocktail was born. This is, pure and simple, the recipe for an Old Fashioned. I’ve discussed bitters many times before, such as with the Stickman Apothecary Chest, and also with the absurd and obscene true origin tale of the term “cocktail”. For Stickman Bitters No. 1, Rob blended the many tinctures he had created from his garden (and woodshop) until he hit on the perfect balance, merging the complimentary top, middle and base flavors in the final bitters together. His own blend of gin, which itself contains about twelve different botanical, spice and plant ingredients, serves as the complex backdrop for the bitters, into which he infused flavors from about fourteen further spices, roots, plants, flowers, fruits and even wood. The final product is a potent, spiced, citrusy experience with layers of interesting flavors that evolve on the palate and work wonderfully well in this Old Fashioned. Cheers! Stir together over ice and strain into a favorite glass. Garnish with a citrus peel.